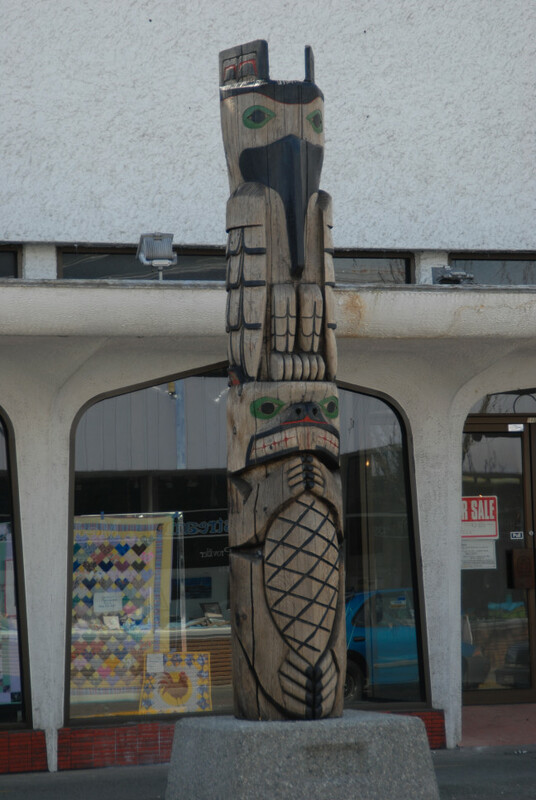 The woman and man are wearing woven Salish blankets; on the base are symbols that are important objects for the Quw’utsun’ people. 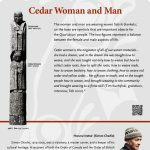 The two figures represent a balance between the female and male aspects of life. Working with master carver Simon Charlie enabled Doug to enhance his carving skills. Doug’s ties to his family influenced this pole; his son Bear (Doug Jr.) is represented here. I grew up in Duncan and I loved working in Duncan. I raised and looked after my family all the time. With Native people, family is huge; everything in life is based on families. My wife, Kathy Horne, and I had a son, so I decided to carve a baby Bear being held by a mother Bear. Family ties and beliefs, that’s why I picked the Bear (Doug LaFortune, Sep 2012). 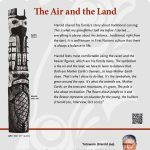 Harold shared his family’s story about traditional carving: This is what my grandfather told me before I started… everything is always about the balance…traditional, right from the start. 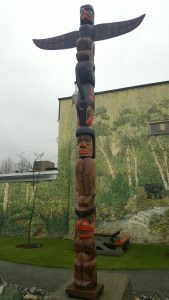 It is well-known in First Nations culture that there is always a balance in life. This is the first pole Doug carved for the City’s collection. 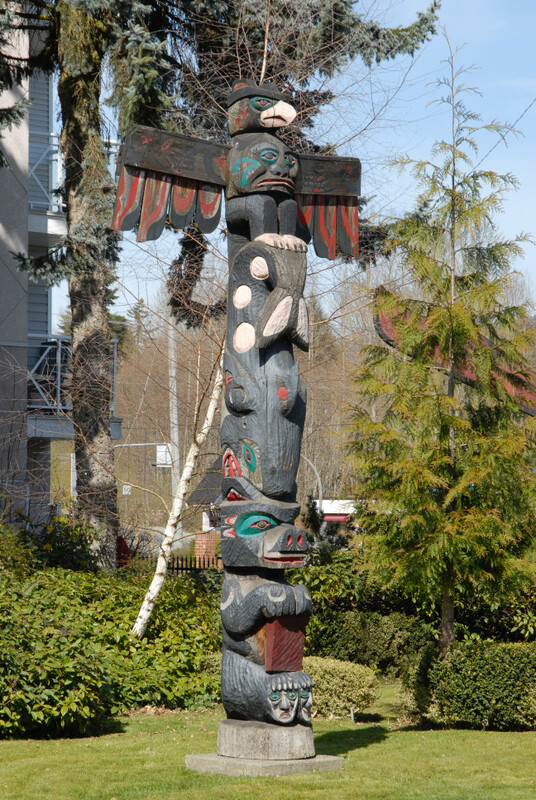 This was the first pole commissioned for the City’s Totem Pole collection and was raised in 1986. As this was the first pole, Francis chose the beaver to symbolize the start of the City of Totem’s project. the Beaver is always recognizable by the large front teeth. 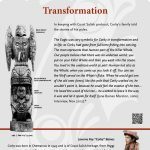 The Eagle for the Horn family represents freedom of spirit. 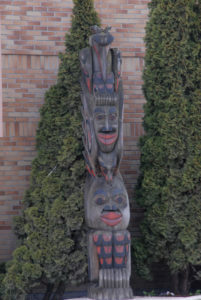 The face on the chest represents the spirit of the Eagle. 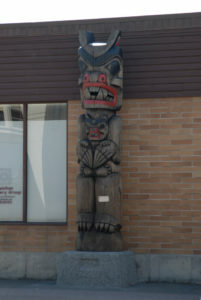 The Beaver was chosen as it represents the builder. 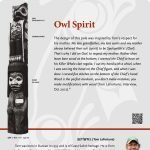 The Chief’s face on the Beaver tail represents the people of the community, the Quw’utsun’ people (Francis Horne Sr., Interview, Jan 2013). Simon Charlie told Tom this story and this pole is Tom’s interpretation. The North Wind, when it really starts to howl, that’s when the Killer Whales would come in and feed in Cowichan Bay. When the North Wind got colder the Whales would head out to migrate, because the Salmon run was finished. The pole represents the harvesting time for the Salmon. With the North Wind, you notice the Killer Whales. you go down to the moutn of the river and jig (a fishing technique) for Salmon in the bay or wait for them to come up the river. 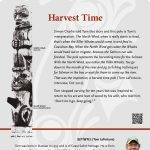 That was the inspiration, a harvest time pole (Tom LaFortune, Interview, Oct 2012). 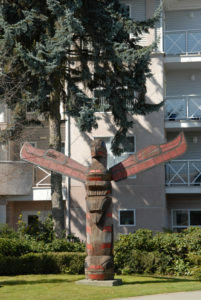 This is the third pole Francis was commissioned to carve for the City in 1986. 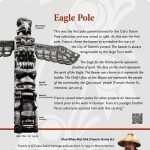 The pole is northwest Coast northern style. 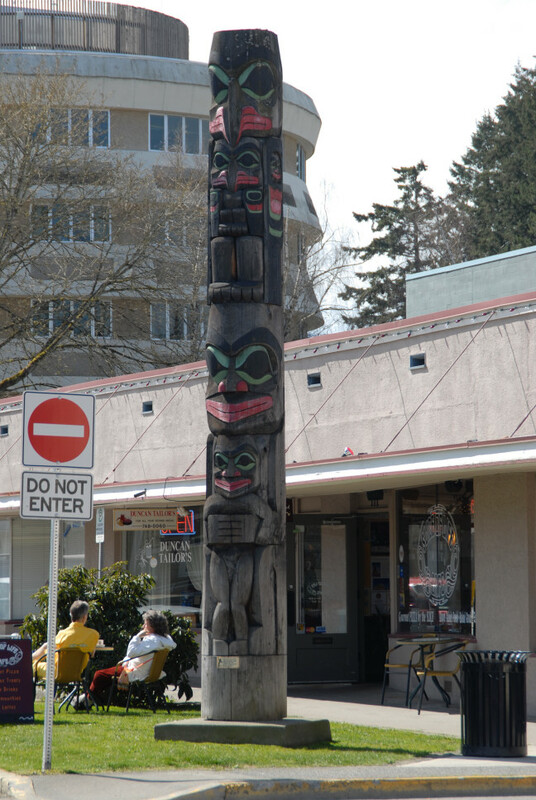 This pole was inspired by the Haida who carved three Watchmen figures on the top of their poles. 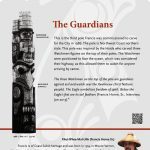 The Watchmen were positioned to face the ocean, which was considered their highway, as this allowed them to watch for anyone arriving by canoe. 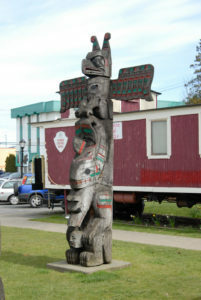 This is the first pole that Don carved for the City’s collection. 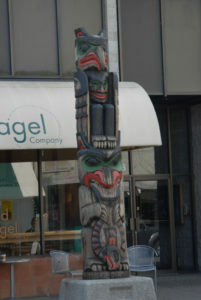 Totem co-sponsored by : H.W. Dickie. 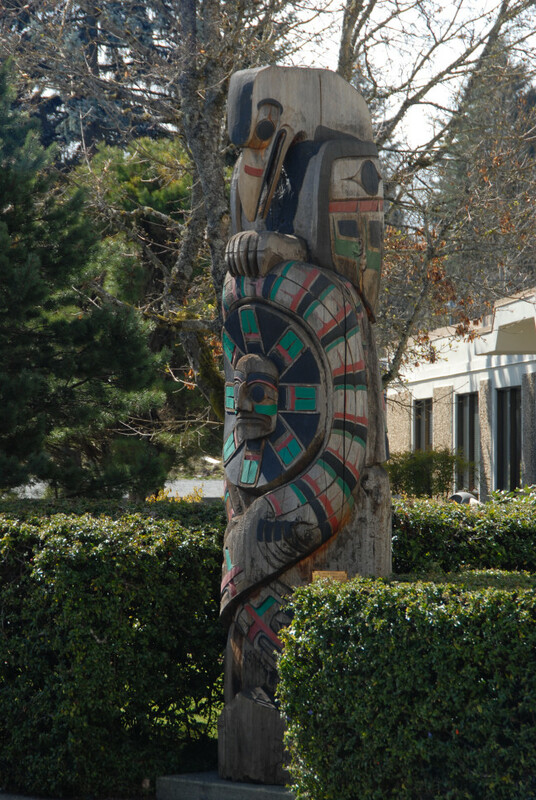 Totem co-sponsored by: The Painter and Gendemann families. 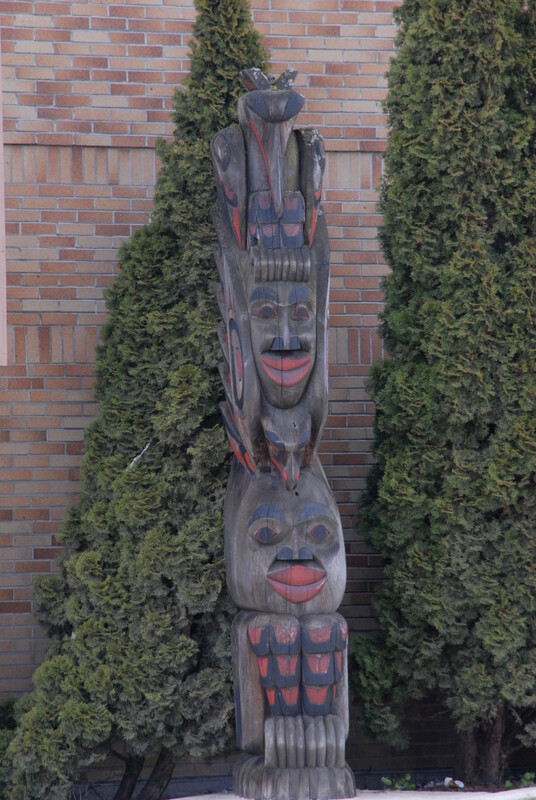 Those who are fortunate enough to have Dzunuk’wa (Wild Woman) in their possession are watched over and protected. Black in colour, with bushy, unkempt hair, she is usually shown with a pursed mouth. 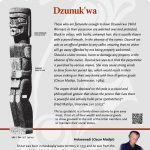 In the absence of the owner, Dzunuk’wa acts as an official greeter to any caller, ensuring that no visitor will go away offended by not being properly welcomed. Should a visitor remove, harm or damage any property in the absence of the owner, Dzunuk’wa sees to it that the perpetrator is punished by various means. 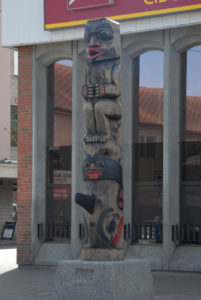 She may cause strong winds to blow from her pursed lips, which would result in their canoe sinking on their way home with their ill-gotten goods (Oscar Matilpi, Submission, 1989). 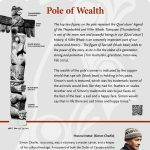 *Pe’sa (potlatch) is a family driven activity to give away most, if not all, of their wealth and material goods to show goodwill to the rest of the tribal members and to maintain their social status. Don’s style of carving is based on Coast Salish form, but he has developed his own distinct, contemporary style. 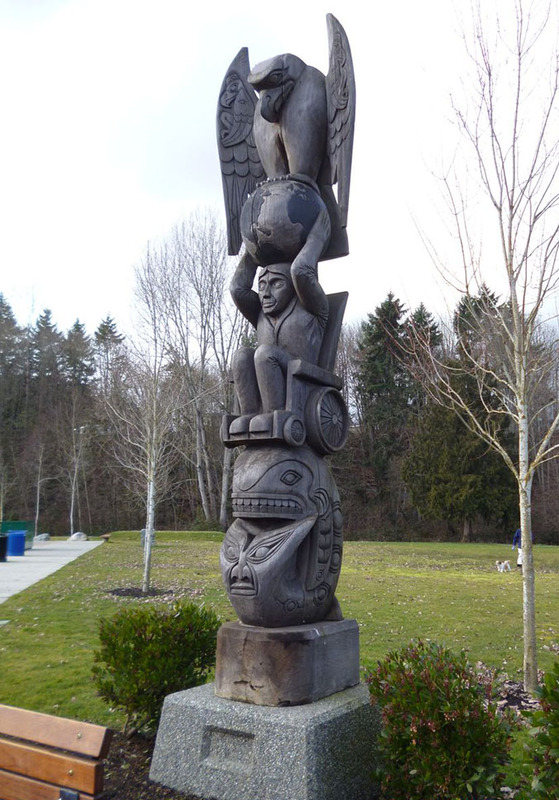 The Coast Salish is not as intricately designed as other groups (Don Smith, Interview, Oct 2012). Master carver Simon Charlie gave Don permission to use his original design for this pole. This is quite an honour to get permission to use someone else’s design, especially when the artist is not directly related. 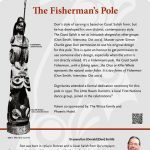 It’s a Fisherman’s pole, the Coast Salish Fisherman…with a fishing spear…the Orca or Killer Whale represents the natural water fisher. It is two forms of Fishermen (Don Smith, Interview, Oct 2012). 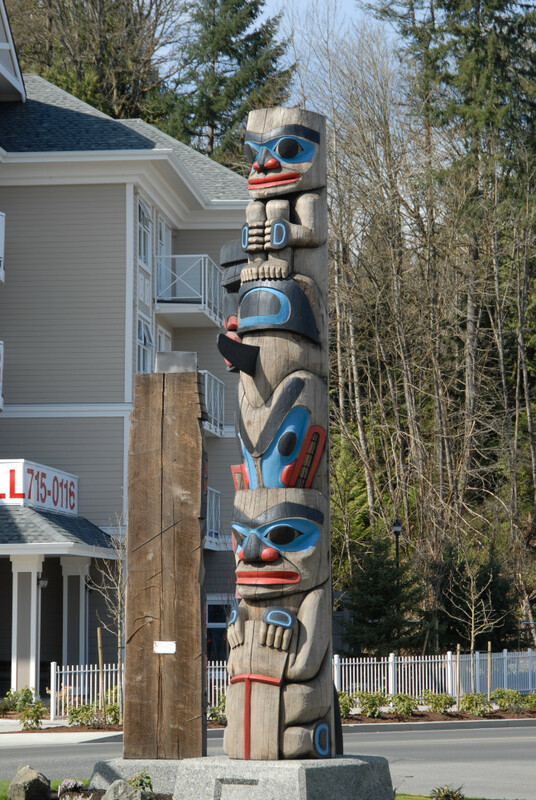 Totem co-sponsored by: The Wince family and Phoenix Hotel. 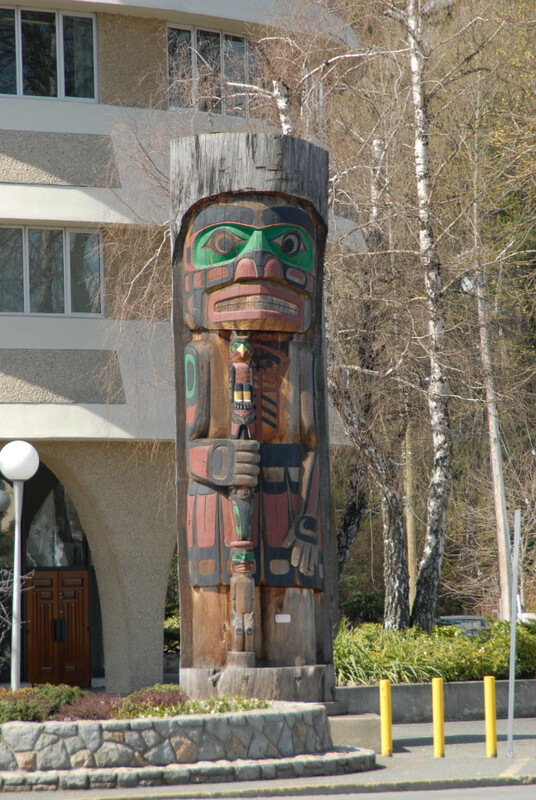 The wealth of the pole’s owner is indicated by the copper shield that spe’uth (black bear) is holding in his paws. 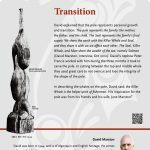 Simon’s work is textured, which was his trademark; some of the animals would look like they had fur, feathers or scales. Another one of Simon’s trademarks was to put faces on the feet of the bear; a sad and a happy face. Simon would say that in life there are sad times and happy times. 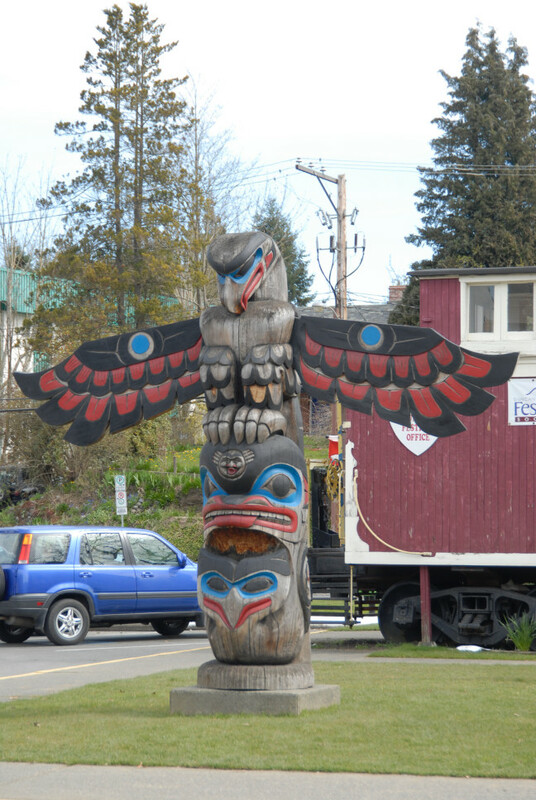 The Seal (bottom figure) has the Thunderbird spirit in its tail. 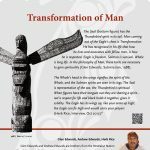 Man coming out of the Eagle’s chest is Transformation. He has recognized in his life that hos he lives and associates with fellow men, is how he is respected. Eagle is freedom, Salmon is survival, Whale is long life. In the philosophy of Man, these traits are necessary to gain spirituality (Glen Edwards, Submission, 1988). 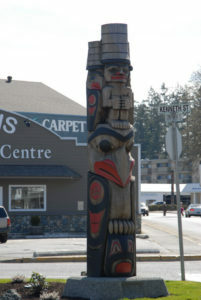 Glen Edwards and Andrew Edwards are brothers from the Penelakut Nation (Penelakut Island). 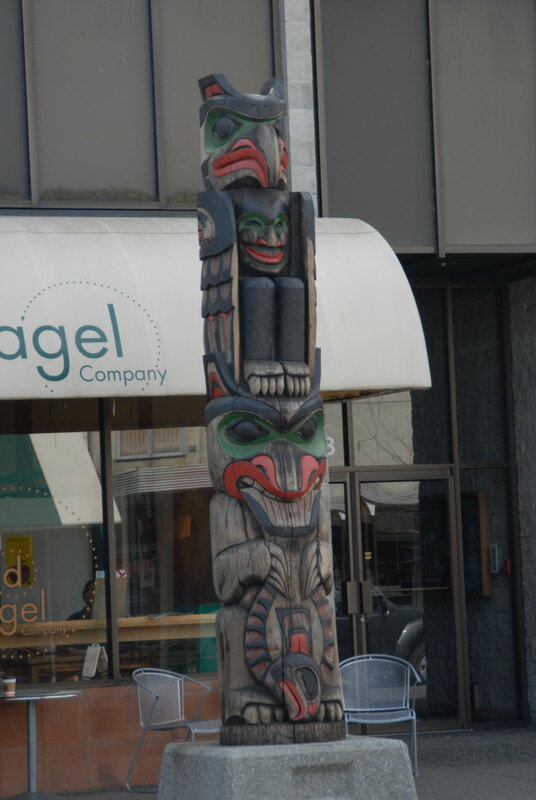 They taught Herb Rice, Sqhwull-ahte-siem, who is from the Snuneymuxw Nation, to carve. 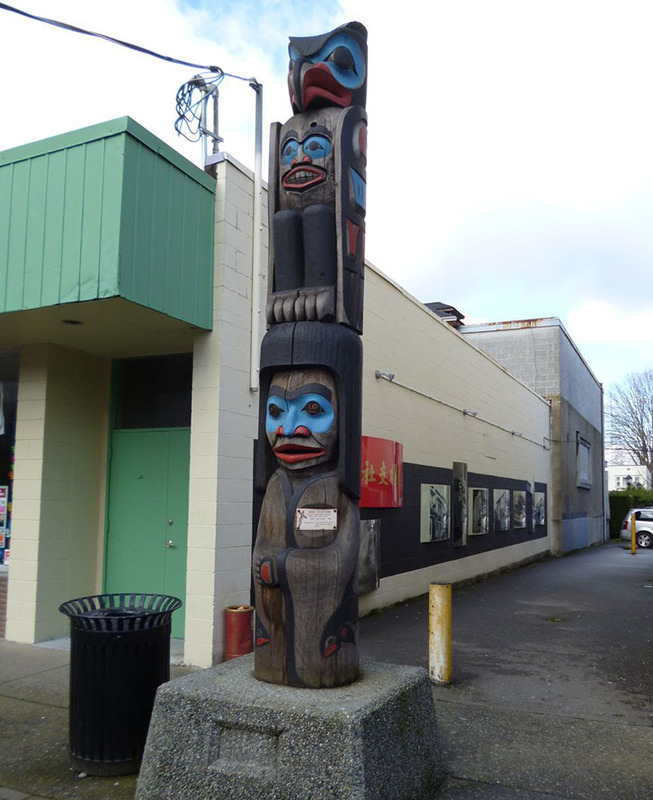 All three are Coast Salish artists, they were self-taught and together they wored on this pole. The design was by Glen Edwards. 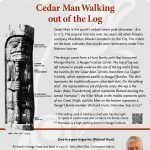 Cedar Man is the world’s widest totem pole (diameter 1.8m [5’11”]). 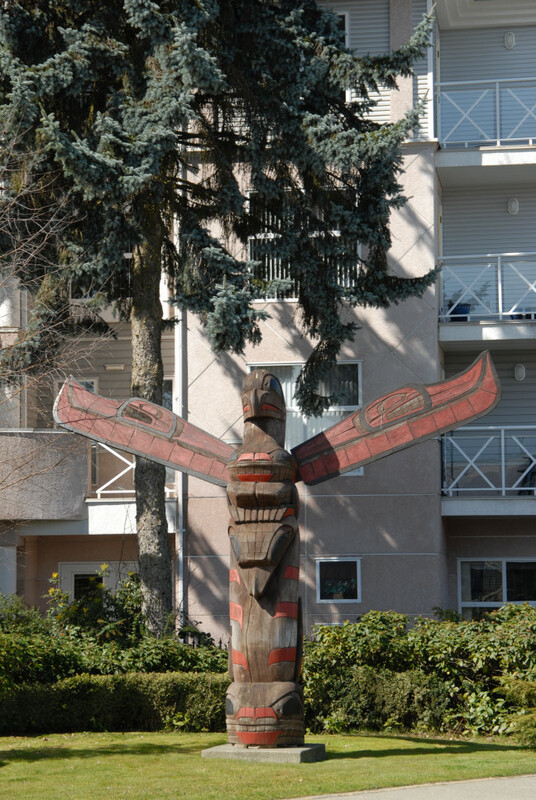 The original tree was over 750 years old when forestry company MacMillan Bloedel donated it to the City. The indent on the back indicates that planks were removed to make First Nations houses. 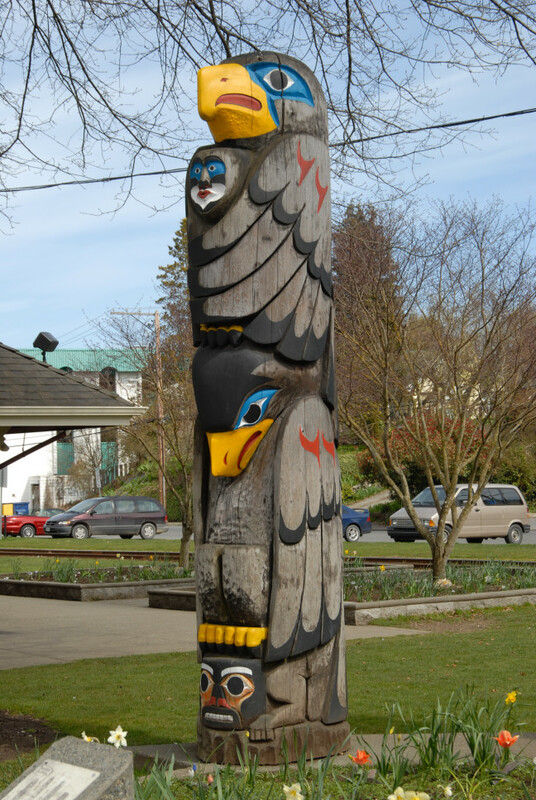 *The talking stick is held by a chief who has the right to speak at ceremonies and contains his family crests. **Hamatsa is a high-ranking dance in Kwagu’ł culture. The following is part of a recorded conversation between Basil and his father Jack James. 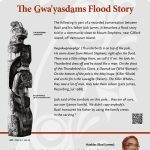 It describes a flood story told in a community close to Mount Stephens, near Gilford Island, off Vancouver Island. 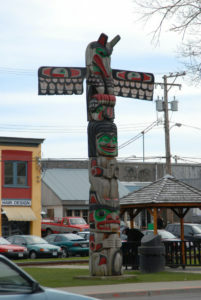 Kwankwanxwalige’ (Thunderbird) is on top of the pole… He came down from Mount Stephens, right after the flood. There was a little village there, we call it K’we. He took his Thunderbird dress off and he acted like a man. 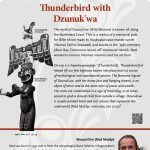 On the chest of this Thunderbird is a Giant, a Dzunuk’wa (Wild Woman). 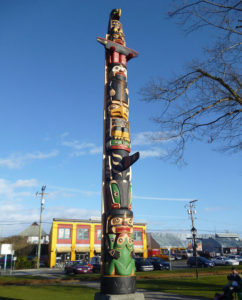 On the bottom of the pole is the Max’inuxw (Killer Whale) and on his fin is the Luwagila (Raven). The Killer Whales…they save a lot of men, they take them ashore (Jack James, Recording, Jul 1988). 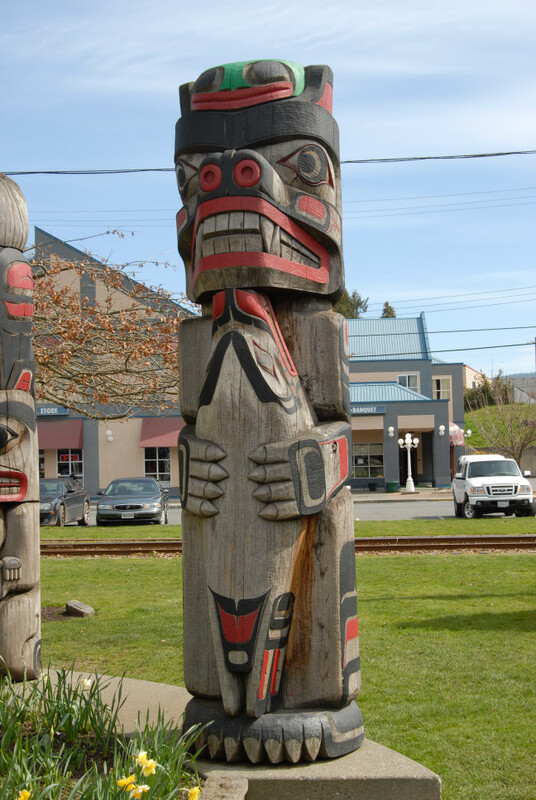 The myth of Dzunuk’wa (Wild Woman) is known all along the Northwest Coast. 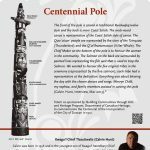 This is a replica of a memorial pole for Billie Moon made by Kwakwaka’wakw master carver Hilamas (Willie Seaweed) and stands in the ‘Yalis cemetery (Alert Bay, Cormorant Island, off Vancouver Island). 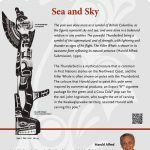 Ned wanted to honour Hilamas’ memory and his art form. The pole was done more as a symbol of British Columbia, as the figures represent sky and sea, and were done in a balanced relation to one another. 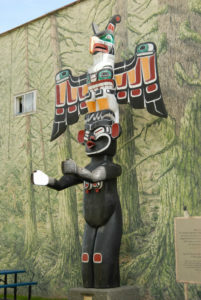 The powerful Thunderbird being a symbol of the supernatural and of strength, with lightning and thunder as signs of his flight. The Killer Whale is shown in its awesome form reflecting its natural presence (Harold Alfred, Submission, 1990). *Hamatsa is a high-ranking dance in Kwagu’ł culture. 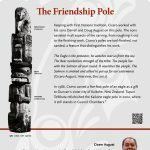 Keeping with First Nations tradition, Cicero worked with his sons Darrell and Doug August on this pole. 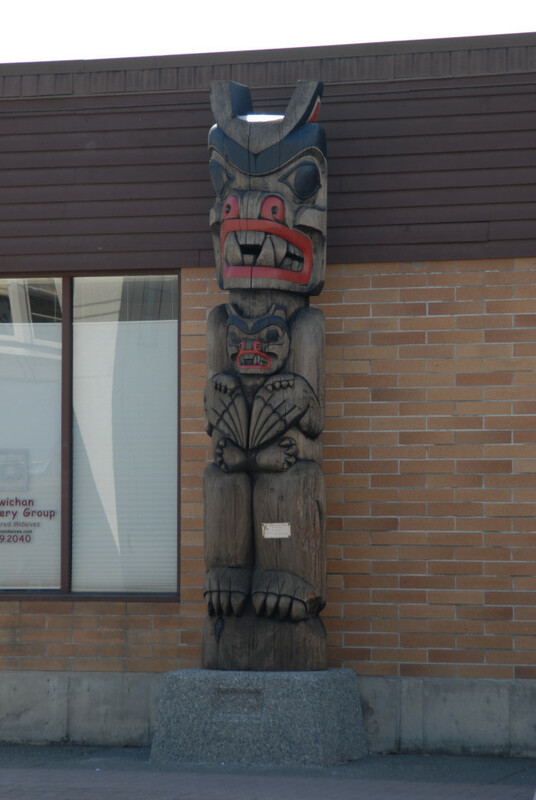 The sons assisted in all aspects of the carving, from roughing it out to the finishing work. 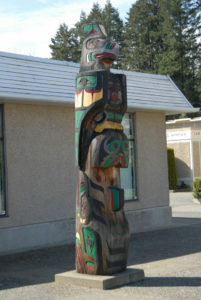 Cicero’s poles are tool-finished, not sanded, a feature that distinguishes his work. 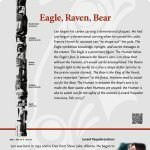 The Eagle is the protector, he watches over us from the sky. The Bear symbolizes strength of the tribe. The people live with the Salmon all year round. It nourishes the people. The Salmon is smoked and salted to put up for our sustenance (Cicero August, Interview, Dec 2012). 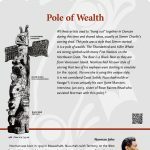 This pole depicts the story of a transformation in life. The bottom figure signifies a Man on a vision quest. During this rite, an eagle carries him away. 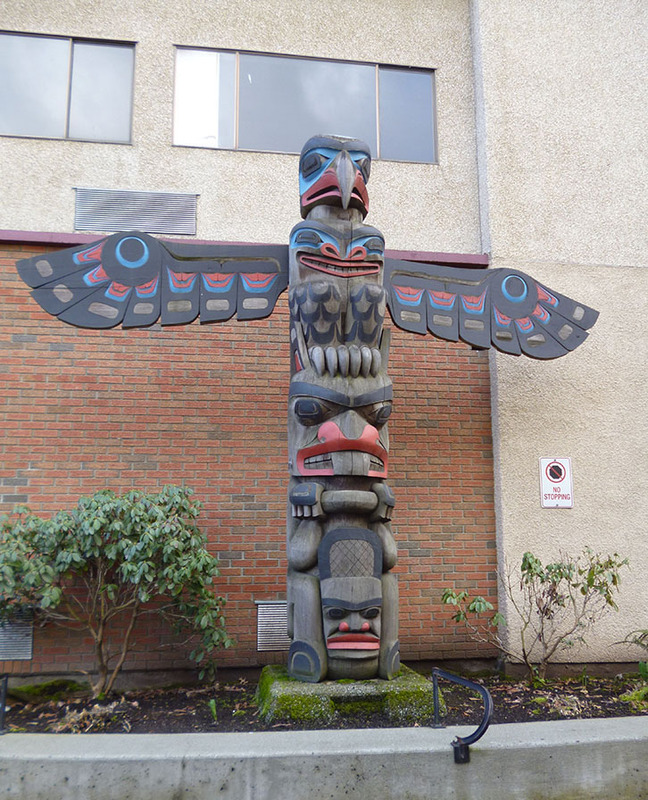 When he returns as a young person, the eagle with the wings wrapped around him represents his Guardian Spirit. His life starts, like a rebirth, or as some people state, a second chance to change his ways. 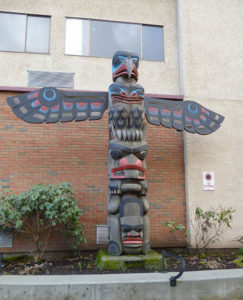 The Eagle represents wisdom, great vision, and healing (Harvey Alphose, Interview, Nov 2012). 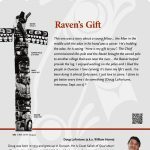 Harvey was born in 1949 and is a hereditary chief with the Qw’umiyiqun (Comiaken) of Quw’utsun’ Tribes through his grandmother Tstaaslewut (Catherine Lohe’), and her father Lohe’ a hereditary chief. He carves masks for his family’s sacred sxwayxwuy (mask dance) ceremonies. 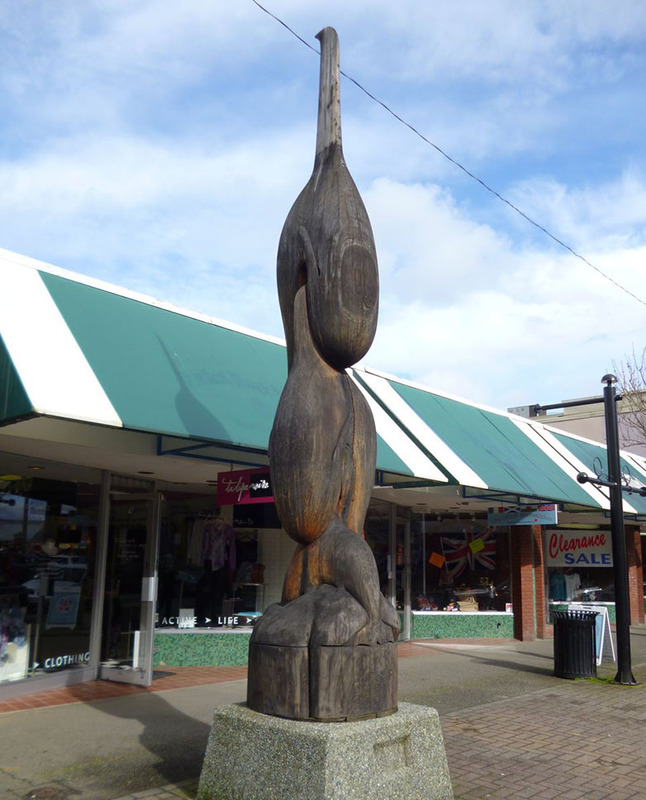 Nelson Canute was born in 1932 and is Qw’umiyiqun (Comiaken). 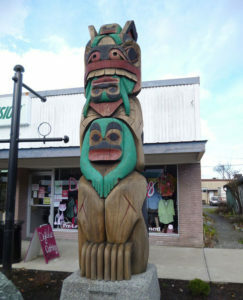 Nelson carved miniature totem poles and this was his first large pole. 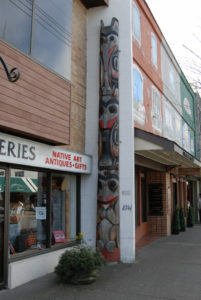 Both artists are Coast Salish. 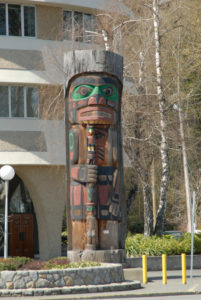 In keeping with Coast Salish protocol, Corky’s family told the stories of his poles. 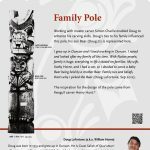 This pole is based on a local Quw’utsun’ legend. David explained that the pole represents personal growth and transition. 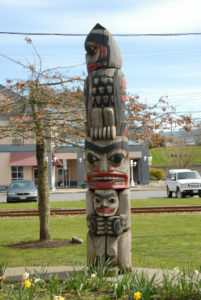 The pole represents the family: the mother, the father, and the child. The Seal represents the family’s food supply. 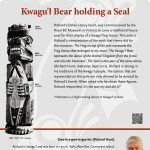 We share the earth with the Killer Whale and Seal, and they share it with us; we affect each other. The Seal, Killer Whale, and Man share the wealth of the sea, namely Salmon (David Marston, Interview, Oct 2012). 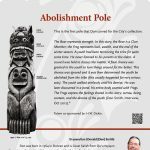 David’s nephew Peter Francis worked with him during the three months it took to carve the pole. In cutting between the top and middle whale they used great care to not overcut and lose the integrity of the shape of the pole. The condensed version of this story is the Raven stealing the Sun. 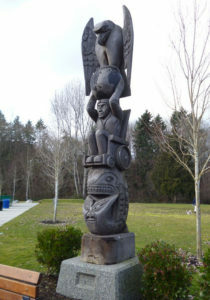 The Raven on the top, the face in the middle represents the Sun, and the bottom figure is the Eagle, he is in a sitting position. His wings come out the side and he’s holding the Sun, grasping it, taking it back from the Sun. The Eagle represents the hero and he brings it back. 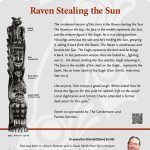 In this particular version, they are locked in… fighting over it… the Raven stealing the Sun and the Eagle returning it… The face in the middle of the chest on the Eagle… represents the Spirit, like an inner Spirit of the Eagle (Don Smith, Interview, Sep 2012). 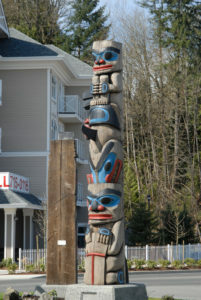 Totem co-sponsored by: The Gendemann and Painter families. 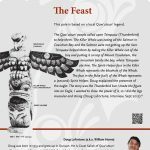 The story goes that the Quw’utsun’ people were starving because the Killer Whale prevented the Salmon from coming up the Cowichan River. So the people prayed day after day, until finally their prayers were answered. 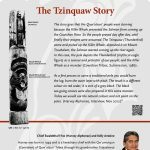 The Tzinquaw (Thunderbird) came and picked up the Killer Whale, deposited it on Mount Tzouhalem; the Salmon started coming up the river again. 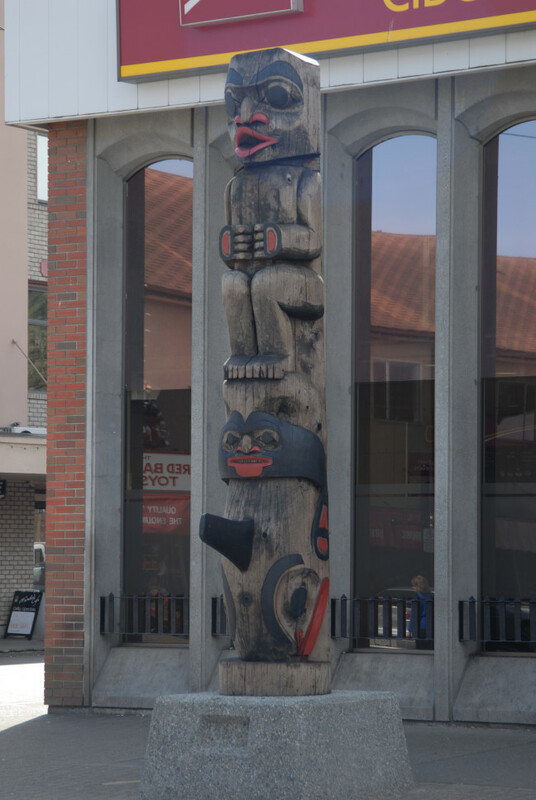 In this case, the pole depicts the Thunderbird (mythical eagle figure) as a saviour and protector of our people; and the Killer Whale as a monster (Cowichan Tribes, Submission, 1986). 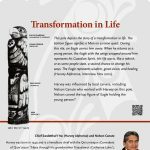 Harvey was born in 1949 and is a hereditary chief with the Qw’umiyiqun (Comiaken) of Quw’tusun’ Tribes through his grandmother Tstaaslewut (Catherine Lohe’), and her father Lohe’ a hereditary chief. He carves masks for his family’s sacred sxwayxwuy (mask dance) ceremonies. 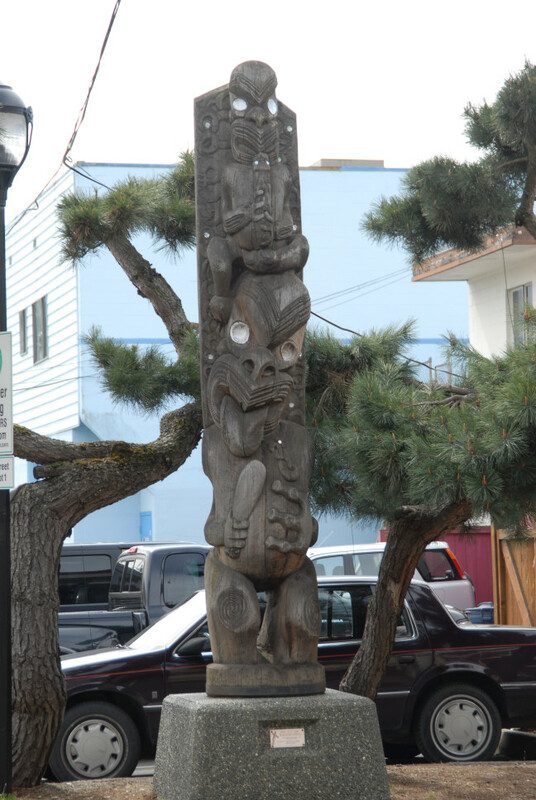 Kelly Antoine carved the upper figure of this pole; he is a carver from Samuna’, (Somenos), of Quw’utsun’ Tribes. 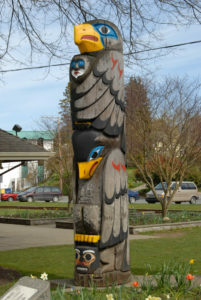 Both artists are Coast Salish. 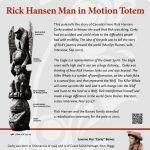 This pole tells the story of Canada’s hero Rick Hansen. Corky wanted to honour the work that Rick was doing. Corky had an accident and could relate to the difficulties people had with mobility. 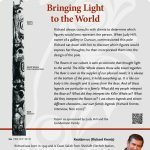 The idea of the pole was to tell the story of Rick’s journey around the world (Marilyn Baines, wife, Interview, Sep 2012). Rick Hansen and the Baines family attended a rededication ceremony for the pole in 2010. Richard always consults with clients to determine which figures would best represent the person. 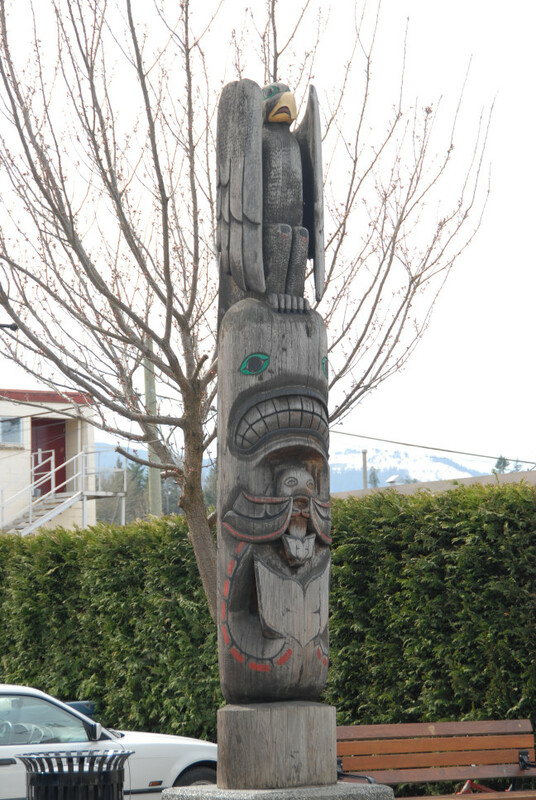 When Judy hill, owner of a gallery in Duncan, commissioned this pole Richard sat down with her to discover which figures would express her thoughts; he then incorporated them into the design of the pole. 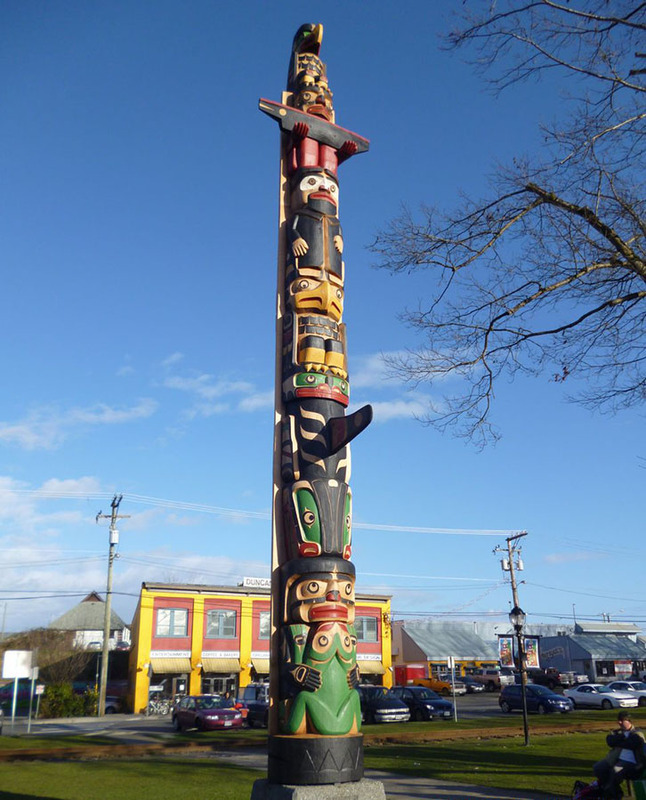 Sacred legends of the Quw’utsun’ people are represented in this pole. 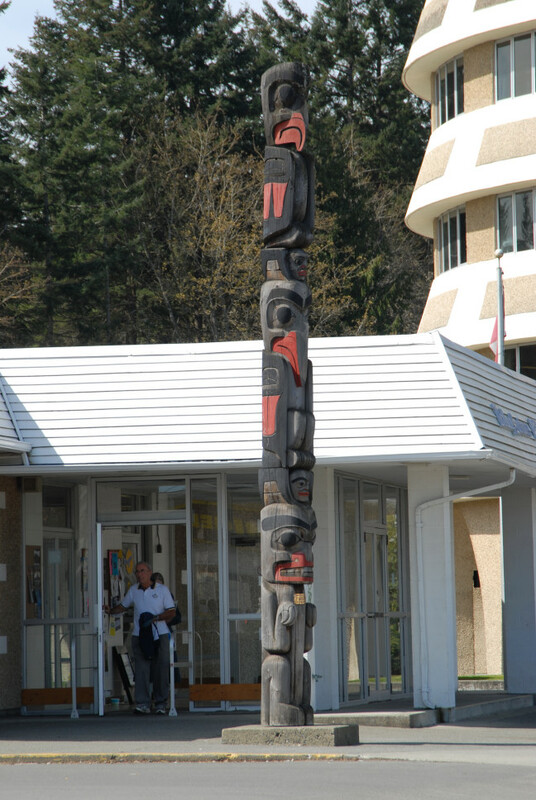 Chief Tzouhalem is dressed in the regalia of a Salish Spirit Dancer: a hair hat, a paddle jacket and a kwutsmin staff decorated with deer hooves. 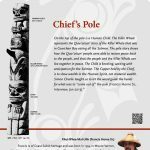 These regalia are still used in Salish winter dance ceremonies. The flood story is represented by the figure of the Frog and is a central legend of the Quw’utsun’ people. 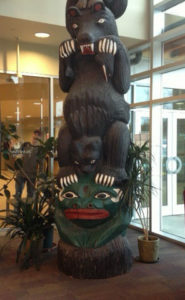 Simon was asked to put a Grizzly Bear on the pole, but he said they do not inhabit this area; the Province insisted. 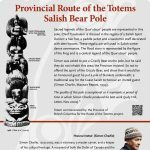 So not to offend the spirit of the Grizzly Bear, and show that it would be an honoured guest he put a pile of blankets underneath; a traditional way for the Coast Salish to honour an invited guest (Simon Charlie, Macnair Report, 1999). 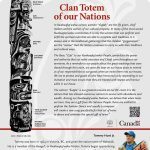 Totem commissioned by: the Province of British Columbia for the Route of the Totems project. Te Anhio Whio is calling out over the forest with the flute…he was bringing them all in tune to the sound of the forest, the deforestation… he was saying to Tane Hiira that we need to do something about it… in a quite protest way. 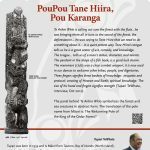 Tane Hiira’s tongue tells us he is a great orator of wit, comedy, and knowledge. The tongue… tells us of a man’s status, character, and talents. The pendant in the shape of a fish hook, is a good luck charm. 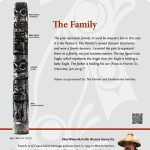 The meremere (club) was a close combat weapon; it is now used in our dances to welcome other tribes, people, and dignitaries. Three fingers signifies three baskets of knowledge: etiquette and protocol; creating of Heaven and Earth; spiritual knowledge. The size of his hand and fingers signifies strength (Tupari TeWhata, Interview, Oct 2012). 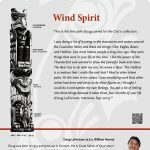 Totem co-spnosored by: Building Communities through Arts and Heritage Program, Department of Canadian Heritage, to commemorate the Centennial of the Incorporation of the City of Duncan in 1912. Ken Evans owned the Ford dealership in Duncan. 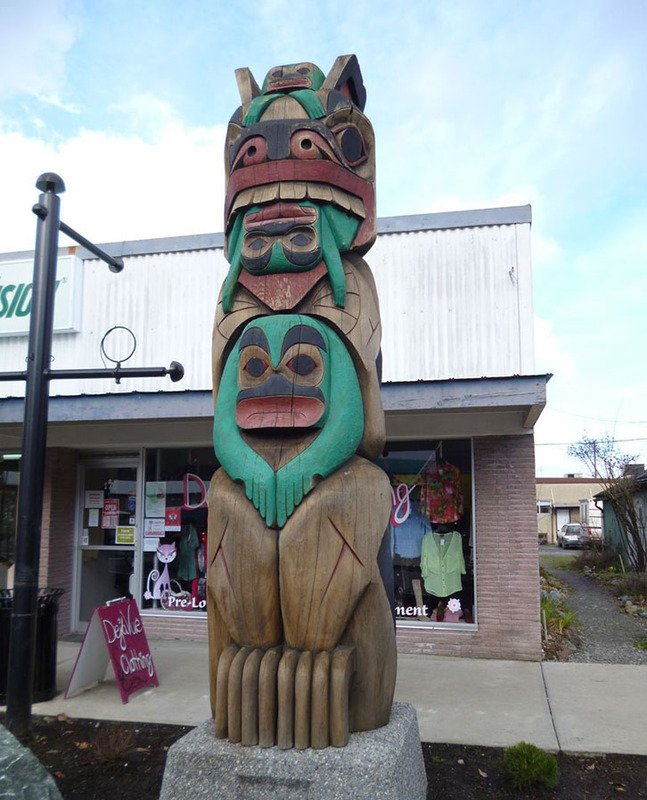 In 1991, he agreed to trade a truck for Lenard’s totem pole. In 2015, Vic Scudder, who later owned the dealership, donated this pole to the City of Duncan’s totem pole collection. 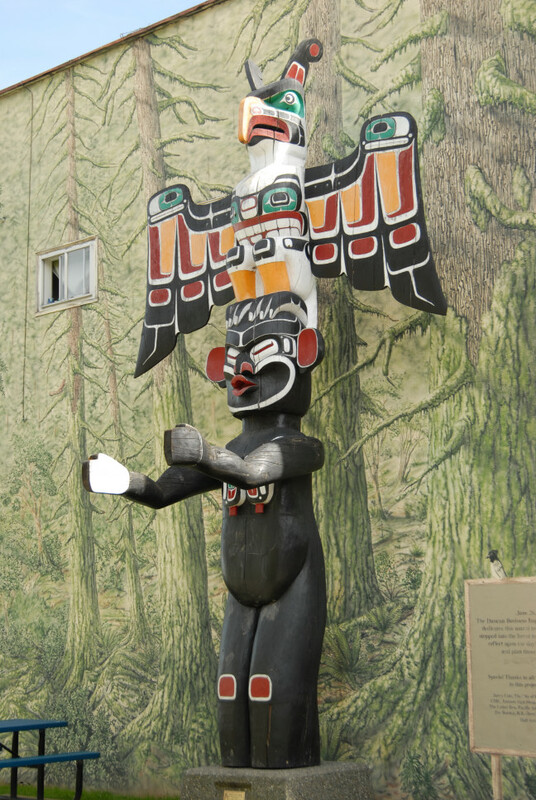 In Kwakwaka’wakw culture, woman “tsadak” are the life givers, chief makers and the carriers of our cultural property. 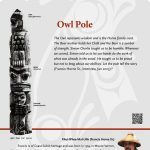 In many of the most sacred Kwakwaka’wakw ceremonies, it is only the woman that can perform and fulfill the spiritual roles that are able to complete such traditions. It is always said in the traditional gatherings that the children “gingananam” are the “reason” that the Nation continues to carry on with their traditions and cultural ways. 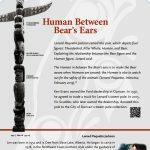 The Bear, “Gila” to our Kwakwaka’wakw People, symbolizes the power and authority that our noble ancestors and Chiefs carry throughout our territories. As a reminder to our people about the great teachings that were shared through this union, we carve the bear on our house posts to remind us of our responsibilities to our guests when we invite them into our houses. 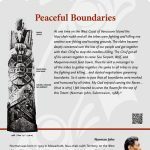 We are to protect and guard all who have honoured us by responding to our invitation and must ensure that they are treated with respect and honour while in our house. The salmon “kutala” is our greatest resource on our BC coast. it is the salmon that has allowed numerous nations to survive with abundance and wealth. 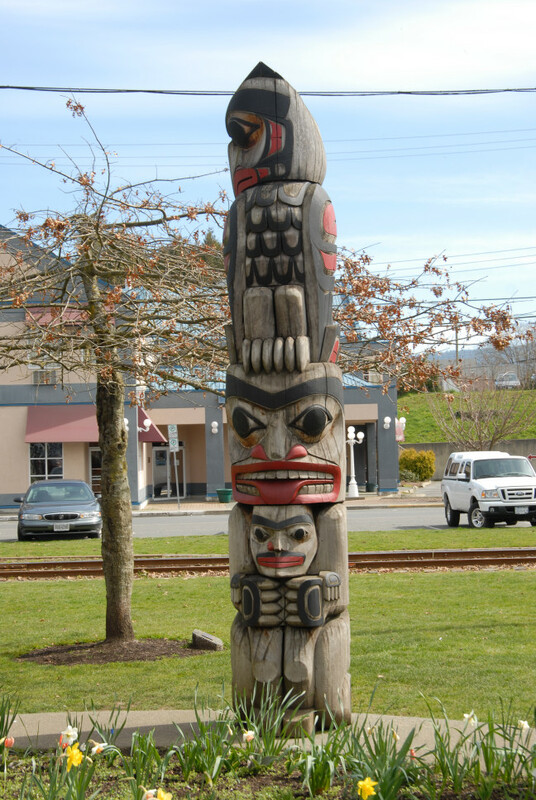 Among our Kwakwaka’wakw Nations, we believe that when twins are born, they are a gift from the Salmon People. Twins are entitled to perform the Salmon Dance and usually a composer will create a new song specifically for that set of twins to dance and celebrate the special gift of twins. 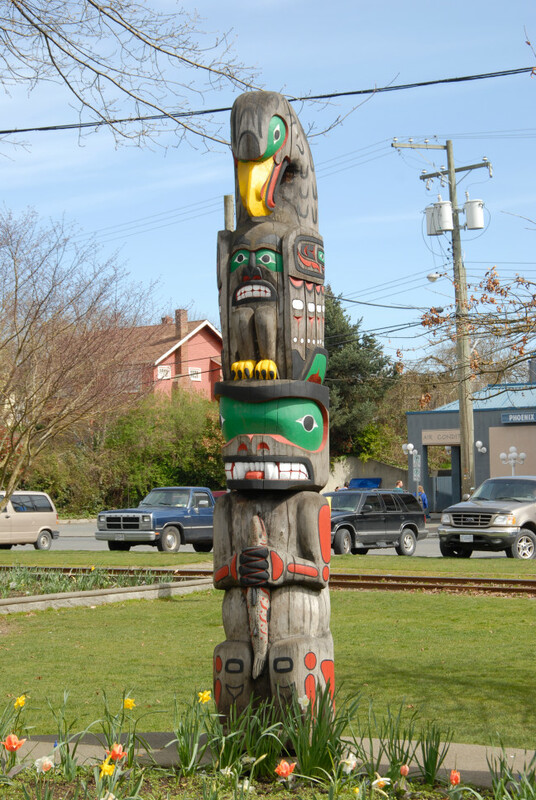 Tommy was born in 194 in Victoria, BC, and given the native name of Walawidi. He is a member of the Kwagul, or Kwakwaka’wakw Nation. 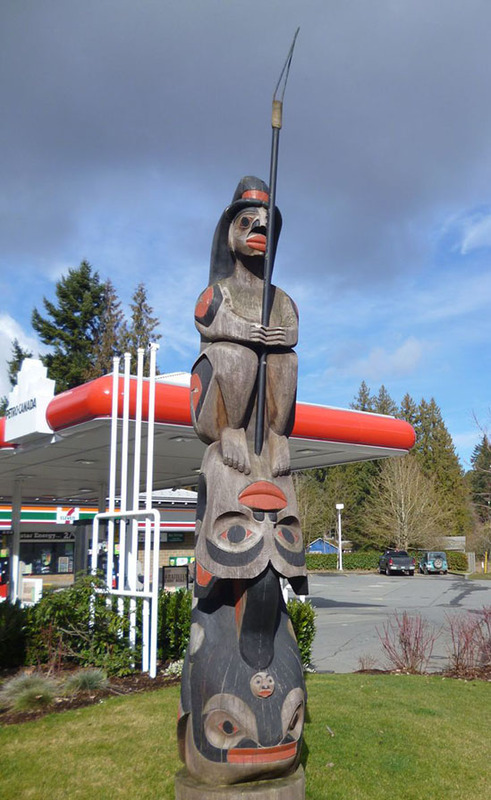 Tommy began apprenticing at the age of twelve with his father, Hereditary Chief George Hunt. Tommy has also learned under the guidance of Sam Henderson. 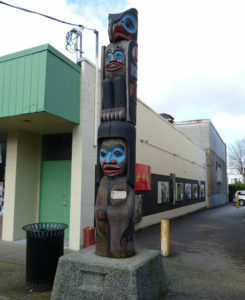 Tommy’s family is deeply involved in the potlatch system and many of his masks have been presented at these potlatches. Tommy has earned the title of master carver and apprentices younger artists.